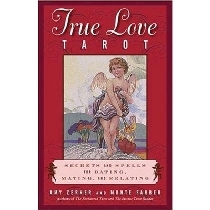 The True Love Tarot is designed to give advice on finding love and on your love relationships. It has 78 cards with fabric collages. The minor arcana are divided into suits of Gems (Pentacles), Wings (Swords), Shells (Cups) and Roses (Wands).